Even though this was released in 1990 (five years before I was born), I have always been both intrigued by and was brought up on past classics such as this. 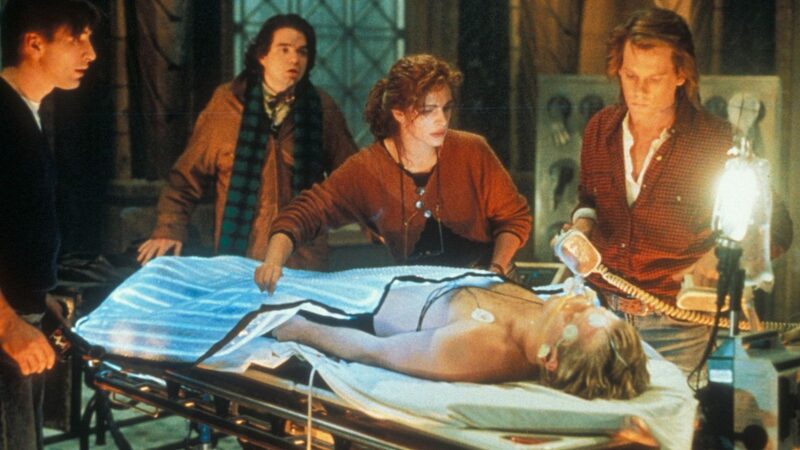 Now, given that Flatliners was released in 1990, firstly, the SFX within this film- in comparison to modern day motion pictures, is something it could definitely be credited for. Although it did include Kevin Bacon..which was certainly an interesting casting choice. Alongside Bacon (before he starred in the EE advert), stars a young Kieffer Sutherland, 80s/90s fan favourite Julia Roberts, Oliver Platt and last but not least, William Baldwin (not to get confused with his older brother Alec who pretty much appears in everything). Right to get to the film itself and to carry on with the discussion about its use of SFX. I was intrigued by the premise of this film, (recommended to me by both of my parents) who, I may add, turned me into such a film buff. The storyline of the film (without giving a lot away), introduces the idea of resurrection, which grants a religious aspect to the picture. This alongside its religious imagery, gives this 90s hit something different to other films released not only around the 90s itself but also to films released previously. By using hallucinations and flashbacks parallel to its plot, it allowed itself to develop and unveil an interesting premise, which I believe will interest modern day viewers, who nowadays in my opinion, are mostly accustomed to either sequels or replicated/recycled plots. With all of the main cast (except for Platt) attempting to see if there really is life after death, the audience are given an insight and planted with the thought of an afterlife. This tactic in itself allows for a deeper feeling and connection with the film and all of its entirety. Overall, I believe that this film should definitely be on your watch list. Due to its fascinating storyline and credible casting choices.